Momotus platyrhynchus Leadbeater, 1829, Brazil. Six subspecies. English: Plain-tailed motmot; French: Motmot a bec large; German: Plattschnabelmotmot; Spanish: Momoto Picoancho. 2-2.3 oz (56-66 g); 12-15 in (31-39 cm), with an unusual widened bill form. Head, neck, and chest are rufous with a black mask on face. Blue-green underbill and black spot on chest. Green upperparts, blue-green belly, and green bluish flight feathers. 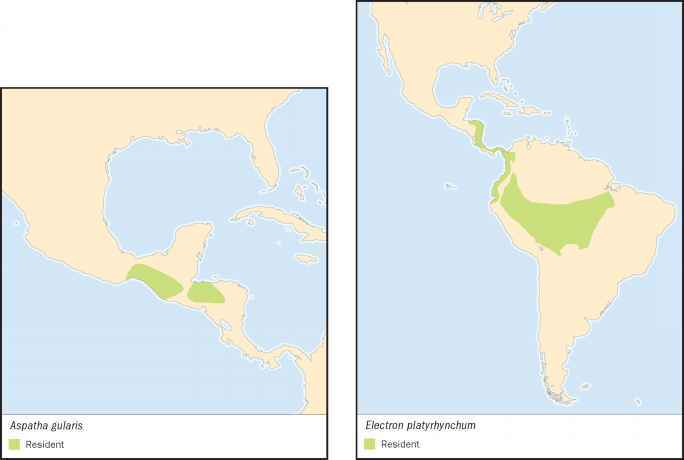 Honduras to northern Bolivia and Mato Grosso, and eastward to Paraguay; overlaps geographic distribution of several other motmots. 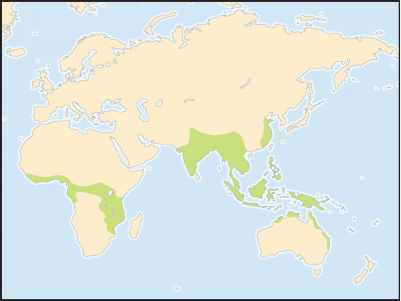 Tropical evergreen rainforest and secondary vegetation; may range to 3,600 ft (1,100 m). Appear solitary but seem to maintain pair bonds during and between years. They are not very active and often go undetected. Tail often pendulates, sometimes jerkily. Inactive at night, but active during twilight at dawn and dusk. Calling most active at early morning light. Nest holes are 3.2-6.6 ft (1-2 m) long and may change direction suddenly. Conspicuous opening is in vertical earth banks, on river banks, on steep slopes beside roads or railways, or in cave or well fissures. Partners relieve each other during incubation twice in each 24-hour period. Young broad-billed mot-mots hatch naked and blind; they rest on rumps and "ankles," which are protected against friction by calluses. Both parents feed young, initially with squashed arthropods and soon with adult-sized pieces of food.